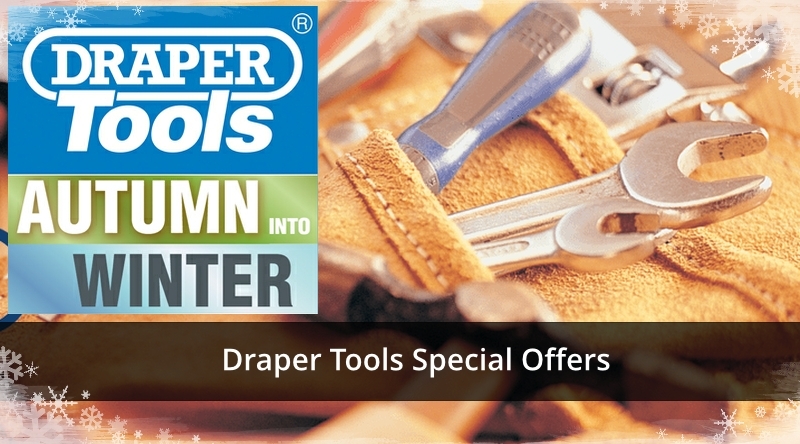 Draper Tools Special Offers for Autumn and Winter 2018. We have some great Draper Tools special offers for this Autumn and Winter, to save you money and and give exceptional value. 66015 COB LED Magnetic Worklight (3W) supplied with 3 x AAA Batteries – List price £10.10 plus vat. OUR PRICE £5.08 plus vat. 06001 CCA Battery Booster Cables (3.5mtr x 25mm²) – List price £66.96 plus vat. OUR PRICE £38.21 plus vat. 40882 ‘Pound Thru’ 6-Piece Screwdriver Set – List price £39.40 plus vat. OUR PRICE £20.75 plus vat. 11964 12/24V 30A Battery Charger – List price £119.18 plus vat. OUR PRICE £102.96 plus vat. 20487 6/12V 5.6A Battery Charger – List rice £39.76 plus vat. OUR PRICE £36.88 plus vat. 60977 Red 3 Tonne Heavy Duty Trolley Jack – List price £157.98 plus vat. OUR PRICE £112.29 plus vat. 22322 12-Piece Impact Screwdriver Set – List price £30.62 plus vat. OUR PRICE £18.33 plus vat. 26338 230V 10mtr Twin Extension Cable Reel – List price £21.66 plus vat. OUR PRICE £18.29 plus vat. 16256 26-Piece 3/4″ Sq. Dr. MM/AF Combined Socket Set – List price £140.40 plus vat. OUR PRICE £94.46 plus vat. 10604 Pistol-Grip Air Inflator – List price £15.92 plus vat. OUR PRICE £15.42 plus vat. 20493 12/24V 10.3A Battery Charger – List price £53.26 plus vat. OUR PRICE £51.67 plus vat. 10954 250mm Alligator® Waterpump Pliers – List price £33.16 plus vat. OUR PRICE £23.54 plus vat. 33892 25-Piece Metric/Imperial Combined Hexagon Key Set – List price £19.88 plus vat. OUR PRICE £10.17 plus vat. 84711 Tub of 100 Draper ‘Hard Graft’ Multi-Purpose Wipes – List price £14.58 plus vat. OUR PRICE £9.08 plus vat. 63404 450g/16oz Solid Forged Claw Hammer – List price £30.28 plus vat. OUR PRICE £15.17 plus vat. 28210 3-Piece Lopper, Shears and Secateur Set – List price £33.70 plus vat. OUR PRICE £17.92 plus vat. 36819 Telescopic Soft Grip Bypass Ratchet Action Loppers with Aluminium Handles – List price £42.68 plus vat. OUR PRICE £27.08 plus vat. All prices quoted exclude VAT. All products are subject to availability. E.&.O.E. Don’t delay today and get down to our parts department at either Abbotsley or Brigstock and grab a bargain whilst stocks last or contact us with your requirements. For more information and images download the Draper Tools Special Offers leaflet by clicking on the PDF link below.